26 years ago dramatic things were happening Europe. On September 11th, Hungary removed all its border check points. On 9th November the Berlin Wall was breached. On 10th November Bulgaria’s Communist president resigned. On 24th November Czechoslovakia’s Velvet Revolution occurred and Vaclav Havel came to power. On 25th December Nicolae Ceausescu, Romania’s dictator was executed by firing squad. Over the New Year Holiday, the Berlin Wall was being dismantled. … The end of the Berlin Wall was the end of probably the most potent symbol of oppression in Europe in the 20th Century. It is disturbing to realize that it all happened so long ago. I could not believe what was happening. It was so hard to take in … that the world order that I had grown up in – that of Cold War and a stand off between two superpowers was seemingly coming to an end. Something that even just months before those amazing events at the end of 1989 seemed completely impossible. I’m not sure that I’d want to argue that what has replaced that era is any better, but nonetheless amazing unprecedented change did occur. The nation of Israel – from the time of Jeremiah on had been longing for a Messiah – someone who would change the course of history for ever. They were so often disappointed, different men came promising what they could not deliver. No doubt Israel felt the mocking eyes of others as they clung onto this seemingly vain hope of a glorious Messiah. Someone who would bring in Israel’s golden age. Everything pointed against it. Israel was a pawn, a minor league nation caught in the ebb and flow of the politics of the real powers. If we are not careful – if we don’t make the time to reflect, to listen, to wait – we’ll miss the Christ-child. We’ll not see the miracle of God in human form. Just as most of Israel missed its Messiah, so God’s grace will pass us by. If you want to make some space during Advent, then on Monday and Friday afternoons most weeks in Advent St. James Church in Ashton will be open for prayer and refreshments, perhaps even for writing Christmas Cards and wrapping presents …… Why not take advantage of the opportunity to be quiet and to pray? Advent is our time to centre ourselves before Christmas, to focus on the true meaning of the Christmas story, to grasp that God’s Son, the Christ, God incarnate, Emmanuel, God with us – Jesus is coming – he’s coming for us. He is coming for me. Secondly Advent is about looking forward, not to Christmas, but to Christ’s Second Coming. Jesus spoke about this our Gospel reading. Passages in the Gospel about the Second Coming are difficult for us to read, partially because it is difficult to disentangle them from references that the Gospels make to the sack of Jerusalem in AD 70. But perhaps more significantly because the Second Coming seems for Jesus to be so immediate. Something that might happen tomorrow. And so we, the Church, have our questions – raised at different times with different intensity. Why has it been so long? Has God forgotten us? Is Jesus never coming back? Were we intended to take it literally? Was Jesus mistaken? Is it important to believe in the Second Coming? How similar we are to the people of Israel awaiting their Messiah. How similar to people like Mary and Joseph, Elizabeth and Zechariah and so many like them living in Judea under Roman rule before the birth of Jesus. How similar too, to those nations waiting year after year under the tyranny of Communism – seemingly without hope. …. Yet in 1989 there was a dramatic change. What was unbelievable, happened. The wall came down and almost like a domino effect oppressive regimes in Europe disappeared, often without a shot being fired. Yes, we are in a similar position to the OT people of Israel, similar to those under oppressive regimes. Similar, but oh so different. ……………. Yes, we wait for something that is, in one way, no more than a promise – a promise to be taken on trust – Christ will come again. But we also have something of the reality on deposit. We have the Spirit present with us and in us as a deposit, a guarantee of the life that is to come – as Paul is at pains to make clear in so many of his New Testament letters. ……….. And when we come to Holy Communion we are able to look back to, and participate in, the realities of Christ’s first coming – his death and resurrection. And look forward to, and participate in, that heavenly banquet in which we will all share – a meal that Jesus promised to eat with us in his Kingdom after his return. Paul in Thessalonians and Jesus in Luke both encourage us to live lives which anticipate Christ’s return, watchful for his coming, overflowing and increasing in love. For we can believe that Christ will return. Things that people dream about, do happen. Christ Second Coming is no more impossible than the collapse of Communism felt to a divided Europe, a divided Germany. The seemingly impossible is possible with God. And God has promised that Christ will return. And so we say with confidence when we come to communion. This entry was posted in Ashton-under-Lyne Blog, Comment on November 29, 2015 by rogerfarnworth. 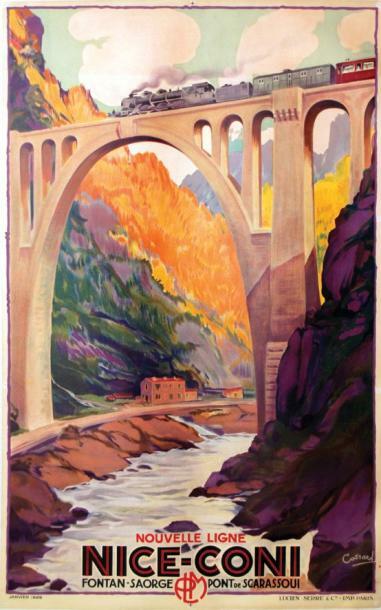 This magazine Railway Wonders of the World was produced in the 1930s when the Nice to Cuneo railway was relatively new. Most copies of the magazine now survive as two bound volumes. I am fortunate enough to own both. This article is a great insight into the line in the 1930s. This entry was posted in Railways Blog on November 15, 2015 by rogerfarnworth. 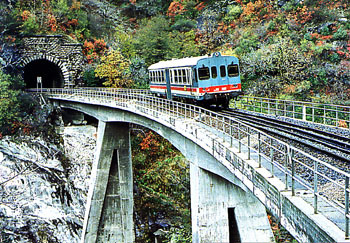 Starting from the sea level, the Nice-Tende railway line rises to over 1000 metres in height as it travels towards Le Col de Tende. 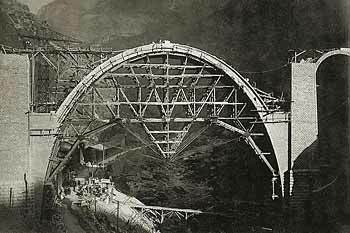 The line was an amazing feat of engineering, a real achievement in a dense, hilly region. 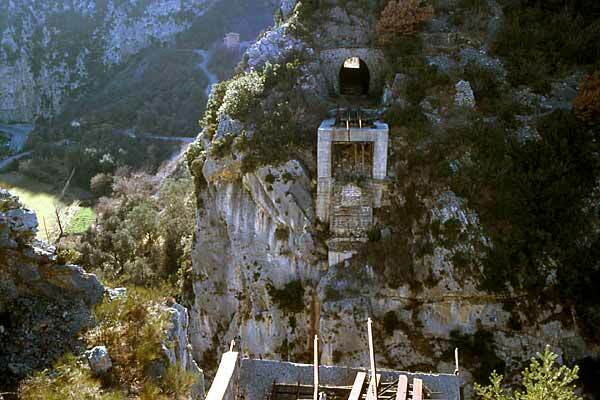 It is distinguished by an impressive succession of structures (over 200 In all): viaducts erected overlooking deep canyons and countless tunnels in the mountains (including 4 helical structures!). 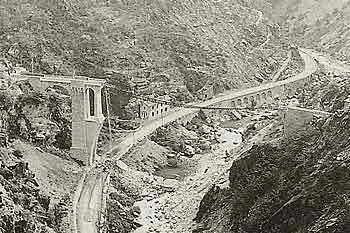 In the immediate post war era the line was closed as many of the major structures had been destroyed. 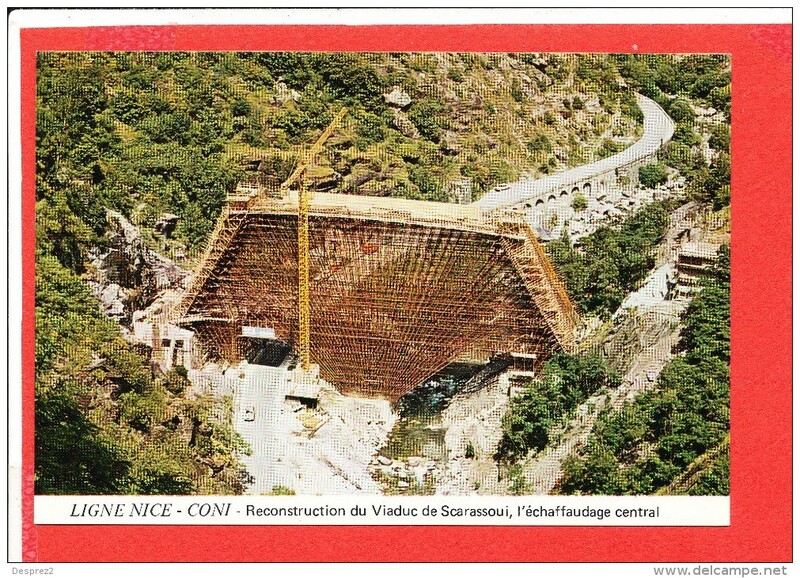 It wasn’t until the mid to late 1970s that those structures were replaced. 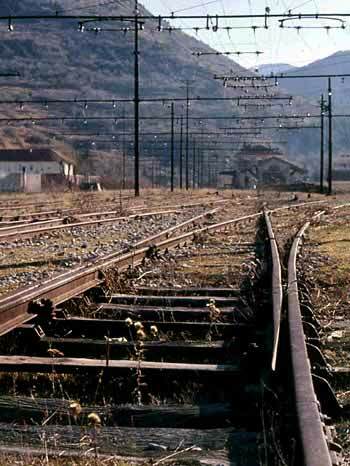 Some of the following pictures illustrate the condition of the line before renovation. 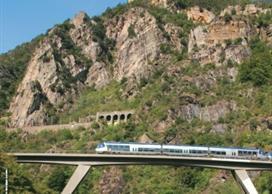 The project to undertake the rebuilding of the structures on the line and to re-lay the standard gauge track was costly and was undertaken by the regional authorities in France and Italy. 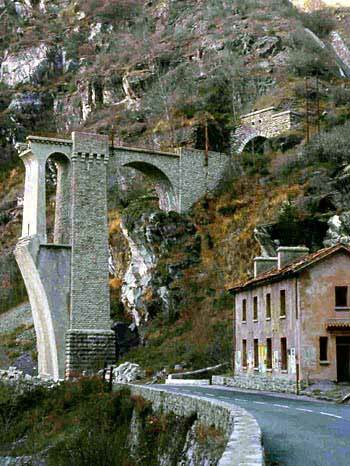 Many of the structures were rebuilt by the end of 1978. 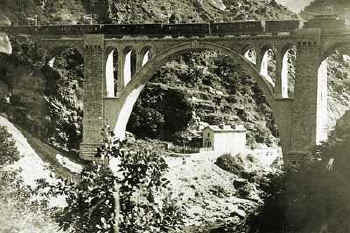 This viaduct was built across the valley of the Roya between two tunnels close to Fontan. 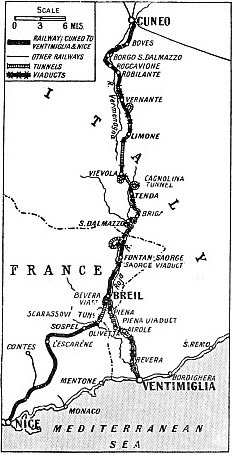 It was commissioned in 1923. 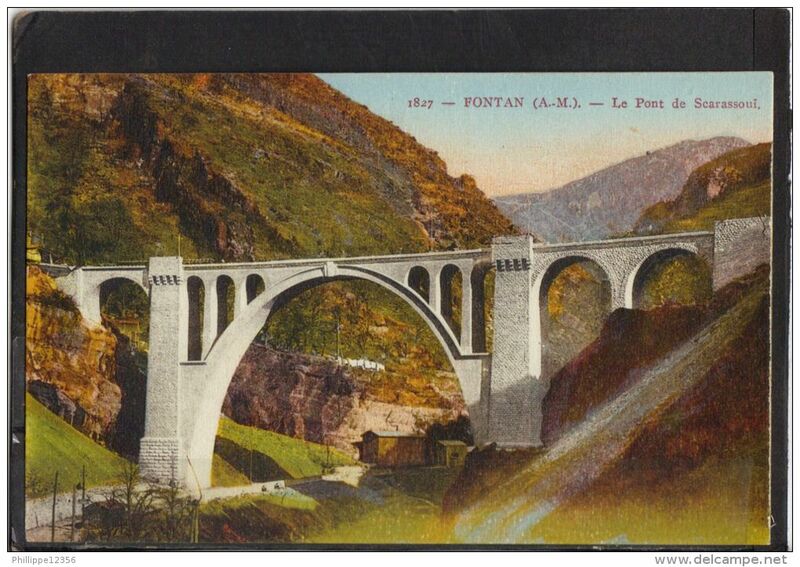 Its designer was Paul Séjourné, the engineer was André Martinet and the contractor was Mercier, Limousin et Cie. It was a graceful, elegant structure. 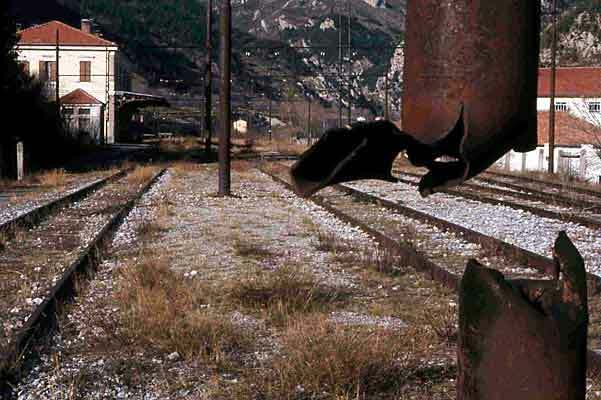 It survived for little more than 20 years before it became a casualty of the Nazi withdrawal from southern Europe in 1945. 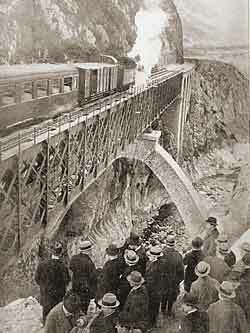 When the bridge was blown the tracks where left hanging over the river. 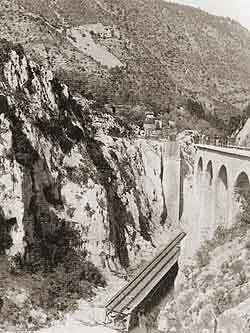 Once the tracks were removed the bridge lay derelict until 1977 when a replacement structure was started. It was simpler and more functional but none-the-less a dramatic structure in its own right. 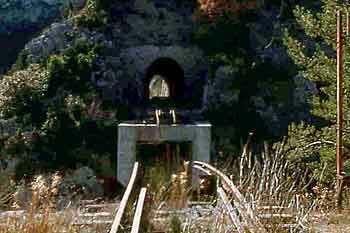 This entry was posted in Railways Blog on November 14, 2015 by rogerfarnworth. The Gospel reading set for today in the church’s lectionary is Mark 1:14-20, where Jesus calls James and John to follow him. process of change – The Ugly Duckling. Each grows to be very different. But their ability to change and grow doesn=t just appear from nowhere. The Potential is already inside of them. Jesus choses James and John to follow him. They encounter Jesus and follow him and in doing so are changed for ever. We don’t know that much about Jesus disciples. We do know that James and John were fishermen. We know that they were relatively slow learners and that on one occasion that asked Jesus to let them sit on either side of him when he came into his kingdom, that they were interested in power and places of honour more than they were in listening to Jesus. As Jesus says in that Gospel passage the places either side of him when he came into his kingdom were reserved for two thieves at the Cross. James and John may not have been quick learners or good listeners but something about being with Jesus, something in this person, Jesus, changes James and John for ever. It doesn’t all happen in an instant, but it starts to happen as James and John listen to Jesus speak and when they see Jesus’ miracles. They are changed as he follows Jesus. And we know how the story ends – these ugly ducklings of men become Swans, they become the most faithful of Jesus followers, one is martyred not long after Jesus dies, the other lives to a ripe old age and becomes bishop of Ephesus and writes letters which remind people that it is not power and influence that matter but love and service. Jesus does not just call James and John. He calls each of us to follow him. Rough diamonds that we are, self-deprecating or over confident, strong or weak. All of us called to be his followers. And, just like James and John, there is potential for change in each of us. Jesus can take us and transform us. We no longer need to feel that we are no good, we can admit to God our weakness and our failings and then God takes us as we are and makes something special. We no longer need to feel like the Ugly Ducking or the Caterpillar, for God in Jesus sees the Swan and the Butterfly that we really are – and as we give ourselves to God – he draws out all the good that is in us. This entry was posted in Ashton-under-Lyne Blog, Comment on November 8, 2015 by rogerfarnworth.